The two-time reigning champion South Carolina Gamecocks are returning to the College World Series finals for a third season in a row. 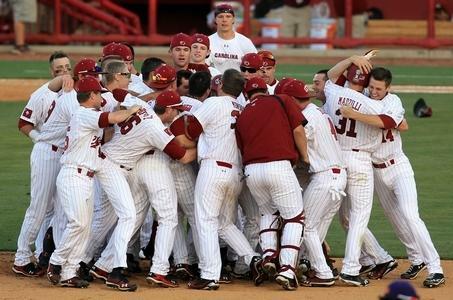 They defeated the Arkansas Razorbacks last night to advance and will face the Arizona Wildcats for the 2012 title. Arizona already has three World Series trophies on the mantle, including one from 1980 when Terry Francona was voted the Most Outstanding Player. But it’s the University of Southern California (the other USC) that is the greatest school in College World Series history. They have 12 championships, twice as many as second place LSU and Texas. Take a look below at number of titles per school and also a chronological listing of all the champions since the first CWS in 1947.